Fans of Sri Lankan theatre are in for a whole week of exhilarating aesthetic thrill ride, as the Colombo International Theatre Festival 2012 is expected to unravel from March 26 onwards. The festival is organised by M Safeer and his vibrant youth from ‘Interact Art Society’. As their very motto says, ‘Interact Art Society’ believes in promoting new trends in modern theatre and creating theatre for the next generation. They hope that the International Theatre Festival will act as a catalyst to raise an awareness regarding contemporary trends in modern theatre. For the past few years, Safeer and co have been showcasing their creative talents in their own miniature, ‘Black Box Theatre’ in Rajagiriya. Shying away from their routine annual procedure, this time around, the group has set out do a grand project in organizing an International Theatre Festival. Artscope visited Safeer and his team to discuss the difficulties that they face on organising an event of this magnitude. However, Safeer feels that it is a project which should have been initiated by relevant authorities. He feels that it is the responsibility of the hierarchy and the cultural ministry to organise an international theatre festival of this calibre. Yet, since the initiation has not taken place till, Safeer and his team have taken the burden on themselves to launch the festival. The productions from Germany, Australia, Iran, India, Indonesia and Pakistan will be showcased during the festival. 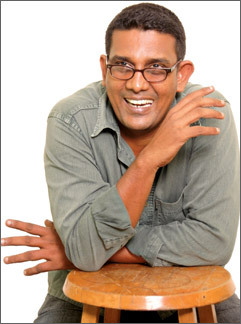 The festival expects to educate Sri Lanka theatre lovers on contemporary theatre-trends. Apart from dramas, an interesting set of workshops will be conducted to educate the youth. The workshop will introduce certain theatrical trends which might be still alien to Sri Lankan theater lovers. These include discussions on, ‘Mix Ability Theatre, Object Theatre and Story-telling Theatre. Other than them, the workshops will also discuss about the technology in theatre in coming years, how it will influence the process of theatre making, etc. The discussions will also be held on participatory theatre and its development across the past decade. The performances are set to happen at British School Colombo and workshops will take place on GOETHE Institut Colombo.